Scores of articles have been written about improving conversions—articles that discuss seemingly mundane details like button size, headline length, brand color and even typography. However, today I am going to show you, along with proofs and examples, something that’s proven to increase conversions every single time. Can’t wait? Let’s jump in. Let me first share this story that I found on Quora. This was the question that was posed. “I’m sorry but I disagree. My father recently wrote a book on Hijackings of Indian Airlines aircraft called IA’s Terror Trail, and self-published it. As a self-claimed Digital Marketer, I went on to create a website for it and make it live on different social media. I did that, and then proceeded to Flipkart and asked them if they could upload my book there. They replied saying that they do not accept first time authors, and that we should contact an independent publisher. Those publishers demanded 50% of our proceeds, which obviously wasn’t feasible. I then approached Amazon, who went step-by-step with me on how to upload it. They use our book as a personalized ad where relevant to the audience, and provide feedback as and when needed. It seems, at least in this case, that good customer service beats patriotism. This answer went on to receive over 7,500 upvotes on Quora. Although, Amazon is a giant and doesn’t need this kind of publicity, imagine what it could do for a small and upcoming company. 86 percent of consumers will pay more for a better customer experience. 89 percent of consumers began doing business with a competitor following a poor customer experience. 79 percent of consumers who shared complaints about poor customer experience online had their complaints ignored. 50 percent of consumers give a brand only one week to respond to a question before they stop doing business with them. 86 percent is a big number, especially since those customers seem to value customer service infinitely more than price or other factors. Now let’s go over some ways by which we can deliver excellent customer service with practical examples of the same. The trouble with being the second-largest home improvement retailer is that you get lots of customer support questions. LOTS. Two hundred employees handled over 130,000 inquiries every month for Build.com, but out of all those calls and chats, questions submitted through the website’s contact form received the lowest priority. So much so that replies to those questions took 9 hours. Needless to say, customers left miffed. Upon reviewing this issue, Build.com discovered that customer support personnel were answering the same questions again and again. There was a need for a centralized system that customers could make use of. That’s when Build.com used NanoRep’s product knowledgebase software to install product FAQ pages on their product pages. 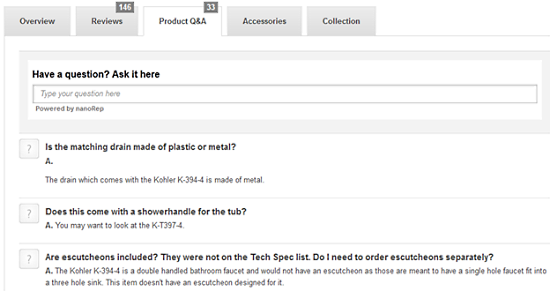 Along with FAQs, question boxes were also placed so that the customers could search for queries. As part of their commitment to become a customer-friendly company, Proposify invested in Groove’s help desk software. Customer support widgets, examples of which are shown below, were added all over the site. 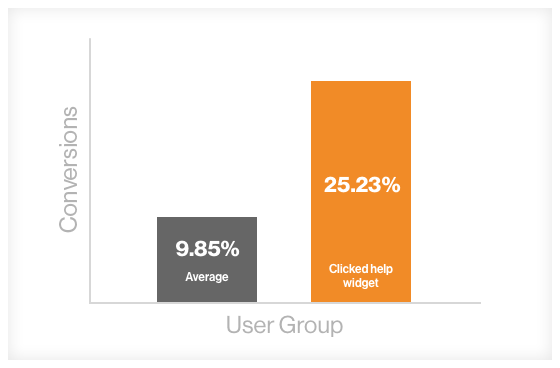 Not only did their trial-to-paid conversion rate improve to 9.85%, they also found that users who clicked on Proposify’s help widgets converted at 25.23%. All of this implies an important fact: Simply by making customer support more accessible, that they doubled their conversions. Livechat is the proverbial cherry on top when it comes to customer support. Also according to the Oracle Survey I quoted earlier in the article, 73% of customers want friendly support executives while only 33% care about brand reputation. But surveys alone aren’t enough proof. So I decided to reach out to customer support personnel at PowerUpHosting and MaxCDN, since I am a customer of both these services. Interestingly, in both cases I purchased the services because they had LiveChat and I had tons of questions. 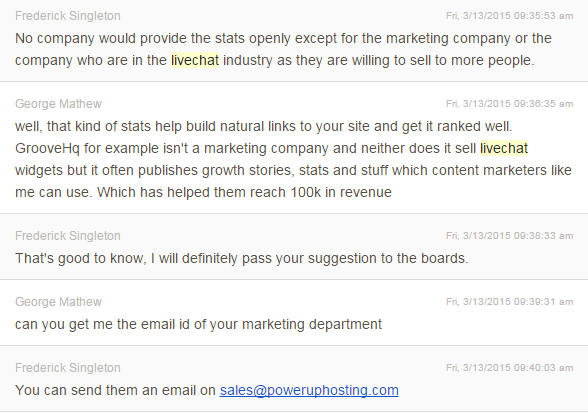 However, when I asked them to provide me stats regarding how (or if) LiveChat improved their conversions, it took a lot of convincing. Finally Udit Goenka from PowerUpHosting got in touch with me. Earlier on they used only Skype to provide customer support but it took a lot of time and most customers weren’t happy using Skype. 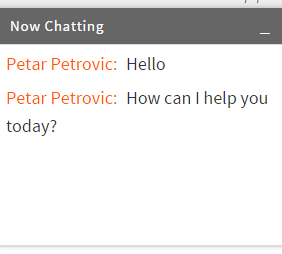 They wanted something spot-on and finally decided to implement LiveChat. “On an average we talk to around 140-150 people on website’s LiveChat every single day (Until March 2015). A whopping 30% who contact us through LiveChat purchase instantly. We capture rest of the 70% as potential leads out of which around 57% sign up eventually. The above Sales purely come from LiveChat Sales (There are customers who comes to our website and purchase right away). Another pattern we have seen is, most of the customers prefer to talk to someone before making the purchase. We have seen an average retention percentage of 82% of those customers who had a talk over chat versus 37% of people who purchased directly. We decided to do some split testing then. We decided to turn off our LiveChat for a period of 7 days, and saw a huge sales drop of around 55% on a weekly basis, this number was nasty and massive, so we decided to have chat on 24/7. 30% of users who contact through Livechat make a purchase instantly. Over 82% of the users who contact through LiveChat have a lower attrition rate. Plus it costs just $ 35/mo per LiveChat representative. Improving customer support and answering customer queries using LiveChat is one of the best things that you can do TODAY to improve your conversions. User studies, live stats, everything points toward this. When are you planning to add one? The post How a Simple Shift in Focus Can Improve Your Conversions Many Times Over appeared first on The Daily Egg.